We have a pleasure to announce that ca 100 researchers from 25 countries will finally present during the 2nd conference of International Association for Cognitive Semiotics. Book of abstracts and final schedule of the conference are available on the website of the conference. 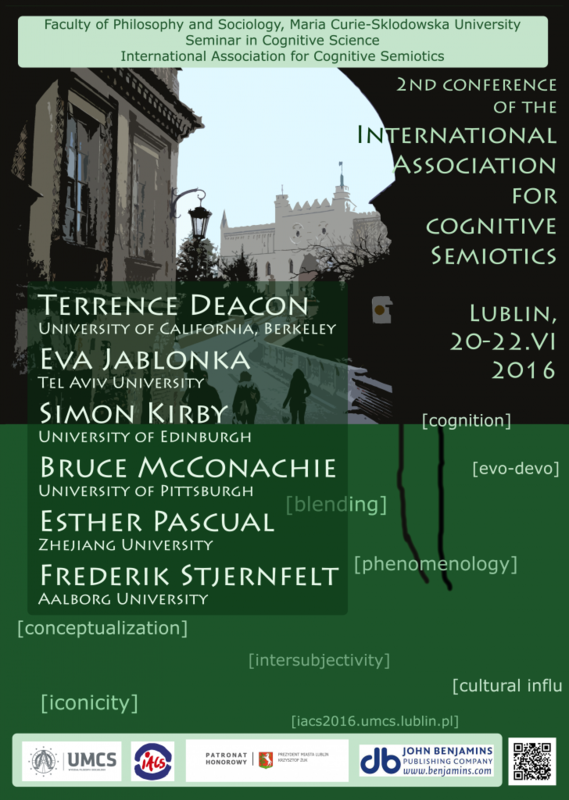 It is our pleasure to announce the (preliminary) program of the IACS2016 Conference to be held in Lublin, 20-22.VI.2016, Faculty of Philosophy and Sociology. We expect 100 participants from 26 countries (including such influential researchers as: Eva Jablonka (evolution), Bruce McConachie (theatre arts), Simon Kirby (language evolution), Frederik Stjernfelt (semiotics), Esther Pascual (cognitive linguistics) and Terrence Deacon (anthropology)). We hope for an exciting scientific event and for fruitful meetings and discussions during the conference.